NAFSA believes international education is a powerful tool to create understanding and respect among people of diverse backgrounds and perspectives, build leadership for the global community, and serve as a crucial means of developing an interconnected world. 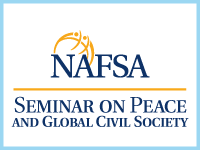 The Seminar on Peace and Global Civil Society is an annual program that brings together scholars and practitioners in peacebuilding with international educators. Using a global learning approach - a critical analysis of complex, interdependent global systems and legacies - attendees are provided with the opportunity to consider and incorporate the ideals, theories, and practices of peacebuilding into their educational programming. The seminar complements conference sessions, online discussions, and other NAFSA events that support global learning, providing a venue for educators to become more attentive to the implications of their work and of person-to-person global engagement. It facilitates a more systemic understanding of how their curricular and co-curricular programming can affect both global and local communities and how programming can address the world’s pressing issues surrounding peace. This annual event is held in conjunction with International Education Week in recognition of the ways in which international education can promote peace. In partnership with the US Institute of Peace, this high-level event discusses topics around technology, civil society, and the importance of global learning in person-to-person interactions.